Are you thinking of replacing the flooring in your bathroom but aren’t sure where to begin? When you’re looking for an option that is both easy to clean and maintain, visit our showroom to browse our extensive selection of bathroom tile in Springdale, AR. 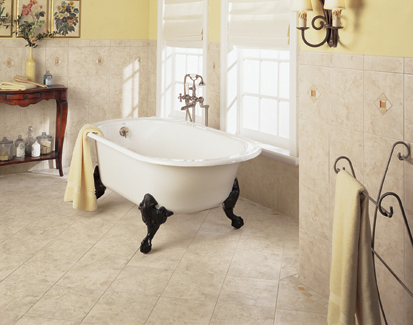 Our tile options are designed to withstand moisture and natural wear and tear. We provide comprehensive services for your bathroom flooring renovation, from helping you find the ideal style for your personal preference and budget to installing the floor in your home. When you visit our flooring store for, you’ll be able to choose from an outstanding assortment of colors and sizes of tile that are suitable for both flooring and wall installation. Our broad variety of textures provides the option to pursue any type of aesthetic, whether you prefer a classic and elegant design or a more modern and contemporary look for your bathroom floor tiles. No matter what type of aesthetic you intend to choose for your bathroom, our skilled flooring professionals are happy to help you every step of the way to guarantee that you’re completely satisfied. In addition to providing the tile for the floors and showers of your bathroom, we gladly offer installation service to ensure that your tile is set in the proper manner. We also recommend having the grout and ceramic thoroughly sealed to protect the materials, which we are happy to provide for you when you choose us to install your new bathroom tile. When we install your bathroom tile, you can be confident in both the appearance and durability of your new flooring and shower surfaces. We provide prompt installation service to ensure that you’ll be able to enjoy your new bathroom tile in a timely manner with minimal delay once you’ve chosen the style that you’d like for your bathroom. With a wide assortment of product choices available in a variety of styles, our selection of tiles features a broad range of pricing options for every type of budget. Whether you’ve already planned ahead and have an idea of the type of tile you’d like for your bathroom or you’re in need of inspiration, you can depend on the staff of our showroom to help you. As soon as you enter our store, you’ll be greeted by our friendly team members, whose expertise and familiarity with all of our products ensures that you’ll find the perfect solution for the new tiles that you choose for your bathroom floor. After consulting with you to discuss your specific goals, preferences, and budgetary aims, we recommend the most suitable option that meets all of your personal needs. By combining affordability with timeless style, our floor tiles are designed to be a perfect match for your design vision for many years to come. That way, you can be confident that the style decision you make today will be something you’ll continue to love in the future. Contact any of the design specialists at our flooring center to schedule a free consultation for your bathroom tile project. We serve customers in Springdale, Fayetteville, Lowell, Cave Spring, and Siloam Springs, Arkansas, and the surrounding communities.